That is great Joyce! Lovely shot. Thanks for hosting. What a great experience!! Great photo!! It's great you were able to have someone there to take your picture! A great moment to catch on camera. Did you get to take him home with you? Binky, that is none of your business. Were you able to link up at my Wordless Wednesday? You should be able to - I tested the link with your linky and it picked up your photos just fine! Fantastic photo :) you look so happy! Go! I find it very interesting! Very cool. Did he autograph your book? Hey, that's a cool pic! it's quite thrilling to meet someone you admire and who's work you enjoy, isn't it. Congrats. That is ok! You could blind the little guys before you eat them. They were tasty. Thanks for linking and hosting, too. 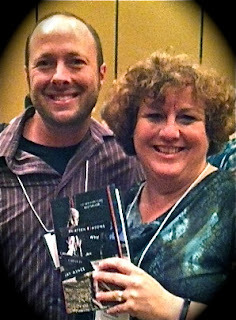 Congrats on meeting Jay Asher, Joyce! That's so cool! You look very pleased, too! It's always exciting to meet a famous author! That is awesome, thanks for you. Great Photo! Happy WW, I am happy I could link up this week! Mine is #43 this time! I need to go to one of those conferences. I have some author's I would love to meet and I would likely be as giddy as though I was meeting a movie celebrity. That's awesome! I would love to meet an author! Sounds like a fun event Joyce!